A Guinness World Record for Cookbooks? Really? Yes, Virginia. There really is a category in the Guinness World Records for the largest number of cookbooks. I speak with some authority on the subject, because as of today, November 7th, 2013, I am the current world record holder! (according to the e-mail I received today from the Guinness World Records, I am ‘OFFICIALLY amazing’!) OK.
(applause here, thank you very much). If anyone is possibly interested in this accomplishment (I use the word ‘accomplishment’ somewhat tongue in cheek), go to http://www.guinnessworldrecords.com and enter ‘cookbooks’ in the search bar at the top right. Now, you may be wondering, Why? Really? Is she kidding? The answers are “for fun and because”, “yes” and “no”, respectively. I LOVE cookbooks and just can’t get enough of them. I am the consummate couch potato cookbook collector and reader. I don’t do fiction. I don’t do sports. I’m not into tweeting, twittering or texting or any of the ‘T” stuff. I don’t spend money on clothes, jewelry or expensive cars. I just like cookbooks. Everyone has a vice, a need to satisfy something deep inside. Mine is cookbooks. 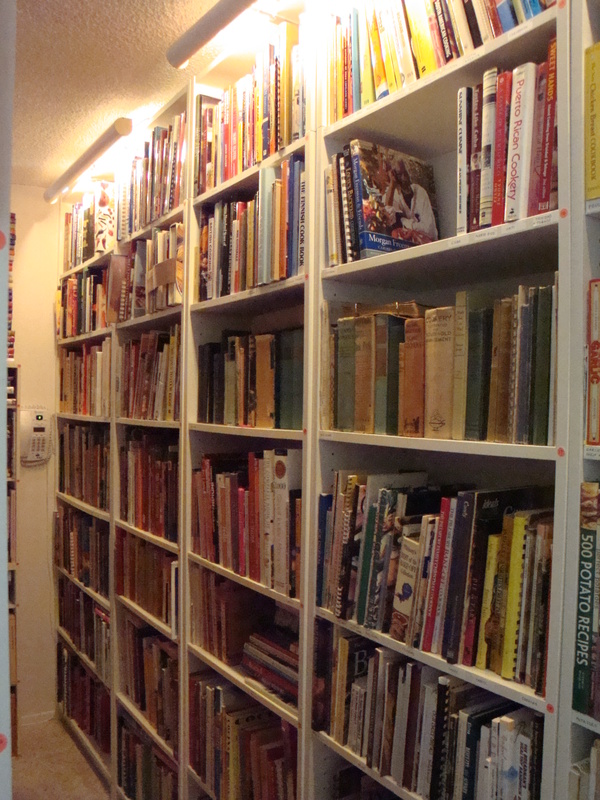 So, although the official count (July 14th, 2013), was 2,970 cookbooks, the collection has grown exponentially, to 3,752. Will I stop? Not anytime soon. My gratitude to Stan, my wonderful, tolerant spouse, whose patience has been severely tested with the ever burgeoning masses of cookbooks, and whose slim physique has allowed him to negotiate his way through the stacks of books. My thanks to my ‘official’ counters for the Guinness World Record Attempt for the largest private collection of cookbooks goes to Executive Chef Chris Pope of Zinc Restaurant in Albuquerque, New Mexico, and to Kirin Farrell, owner of Title Wave Books, also in Albuquerque (and to her assistant, Bonnie). This entry was posted in Cookbooks, Cooking, Guinness World Records, Uncategorized, Vintage Cookbooks and tagged Albuquerque, Cookbook, cookbooks, Cooking, Guinness World Record, New Mexico, social history, World Record. Bookmark the permalink. 4 Responses to A Guinness World Record for Cookbooks? Really? Hi Jan: can you give me your e-mail or contact number? Thanks! Sue, I read Leslie Linthicum’s article on your collection a couple of years ago and wonder if you are interested in some books that i have culled from my collection. I live in Abq and would love to find a new home for some of them before i donate them to someone else. thanks! Collecting cookbooks is a GOOD vice to have! Congratulations!